Late 1960s Prestige “Tiki Mask” Japanese Guitar!!! – Drowning in Guitars! Late 1960s Prestige “Tiki Mask” Japanese Guitar!!! OK, so this one is probably ugly, or beautiful, depending on your slant. I think of this guitar as a Rorschach test for all of us kooks out there. “What do you think of when you look at this guitar?” I think of Linda Harrison in a cave girl bikini! Remember the first Planet of the Apes movie???!?! That movie was from 1968, and it’s probably the same year this guitar was being sold, but couldn’t you just imagine that if the apes had a band, this guitar would be cranking out beach party themes? Feel free to analyze. Just looking at the pickups, the shape of the headstock, and the tremolo, I feel this is a late 1960s guitar. This is a Kawai made guitar (confirmed by a former Kawai employee) from the period when Kawai took over Teisco and just went NUTS with all sorts of crazy guitar designs! The finish is original and unlike anything I’ve ever seen. This particular guitar was once owned by bizarre collector extraordinaire Dan Forte (Teisco Del Rey). From there it passed through the hands of some serious vintage guitar experts like Cameron MaClean, to Bill Menting, and then to yours truly. Cameron actually owned Hound Dog Taylor’s Kingston Kawai, and as the story goes Cam took this Tiki Mask guitar to Hound Dog’s family and asked if the Dog actually owned this guitar too (that was the rumor surrounding this guitar). Hound Dog’s family freaked out at the sight of the Tiki Mask guitar and said they’d never seen it before! And why does everyone call this the Tiki Mask guitar? Well, it seems that just like this guitar, the name has passed along with it! Just the way it is I suppose. I was told on the solid bodies, it was a one year production, with about 90-100 units. There was also a hollow body version….you know the movie “Goldmember”, the Austin powers flick? There’s a scene where the young Austin is having a go with a young lady, and if you look behind him, you can see the hollow body with the same paint scheme. The hollowbodies were also only made for a year or two, but were definitely Teisco or Kawai made. Even the hollowbodies are only Prestige branded. The hollowbodies are more plentiful, but that’s because they were an existing design that only required a special paintjob. This solid body is a totally different design. One thing I’m learning about researching guitars is to respect the opinions of those who’ve been doing it longer. Dan, and Bill, and Cameron are real gentlemen and I’m thankful that they’ve helped me out here and there, and this gratitude will be payed forward one day. I could write on and on about the nice guys I’ve talked with! Anyway, back to this guitar!!! So there’s that flashy Prestige badge, and if you look at the headstock, it’s exactly the same as the Flying Wedge. Both guitars share a lot of similarities, which leads me to believe that they share a similar “birthplace.” Of course my man Dano had to do some work on this guitar. We did the standard swapping of the volume pot, taking out the original 100k pot and putting a 250k pot in there. The tone pot was a 500k so that one stayed. The pickups read out at 5.28k for the bridge, and 5.21 for the neck. This guitar also has the cool series wiring I’m always raving about, and when you have both pickups turned on the output doubles to 10.30k. These pickups are really hot sounding, and just want to run away on you! They’re howlers fo’ sho! They were just on the verge of getting microphonic, but they just sounded so cool and aggressive, that I like ’em just the way they are! The factory soldering work was very well done on this guitar, and overall it was built rather well. Dano also did a beautiful re-fret on this guitar, but as usual with his work, it was done perfectly, tastefully, and seamlessly. There were also some parts missing on this Tiki. The bridge was set up for slide because it was unscrewed from the body and had felt and cardboard underneath it so it could be moved around freely. One knob was missing, but Dano was able to find a close replacement. I also bought a new tremolo arm for the Prestige, but when I installed it I noticed that the trem was blocked off! Have to add that to my “to do” list! We also had to replace one tuning key. I’m not totally sure if the bridge and knobs are even original to the guitar, but at this point I don’t give two shites because this I just love this guitar so damn much! And check out the plastic strap buttons!?!?! I don’t think I ever saw those on a Japanese guitar before? Maybe they’re not original either? So there you have it, another wacky guitar from a wacky time that passed through the hands of some wacky people and landed in the studio of a totally normal person. Who thinks of Linda Harrison every time he looks at this guitar. Oh yeah, I’m normal. At least normal enough to post a video of good ‘ol Mike Dugan trying to tame the beast! With a slide! By the way, I really want to hear from anyone who knows anything about the Prestige brand!! Give it up!!! Remarkable things here. I’m very happy to see your post. Thank you so much and I’m looking ahead to touch you. Will you kindly drop me a mail? Can I please get a copy or even a picture of the wiring guts? 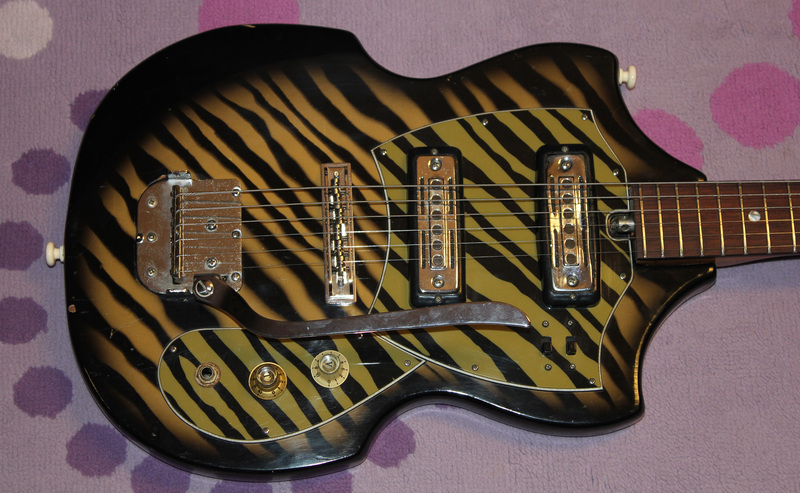 (I’m attemting to restore a Teisco w/ 2 single pickups and 2 on-off sliding switches just like it)…Just can’t get it!